This beautiful little park sits on a triangular piece of land bordered by University Park, 10th Street and Indiana Ave., across from Wishard Hospital. 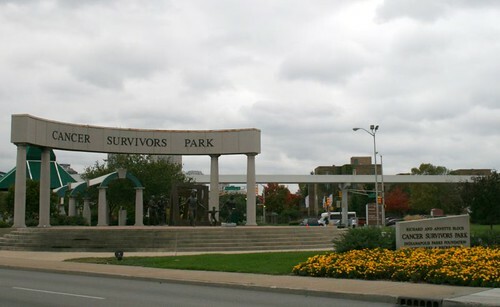 The 1 1/2 acre park is a tribute to those who have survived cancer. 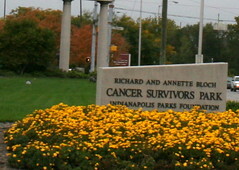 The Cancer Survivor Park is the inspiration of Richard and Annette Bloch. Richard, the “R” in H&R Block is a lung cancer survivor whose goal is to provide 52 such parks around the country. Upon entering the park, visitors begin a Positive Mental Attitude walk, composed of 14 inspirational and informative plaques. In the center of the park is an interactive computer screen which depicts the names of local cancer survivors. There are also eight life size sculptures depicting cancer treatment and successes.